IL-15, induced by innate immune stimuli, promotes rheumatoid arthritis and inflammatory bowel disease. However, its role in autoimmune type 1 diabetes is unclear. Our aim is to define the role of IL-15 in the pathogenesis of diabetes in the NOD mouse model. We generated NOD.Il15 −/− mice expressing a polyclonal repertoire of T cell antigen receptor (TCR) or a transgenic TCR and monitored diabetes onset and insulitis. NOD Scid.Il15 −/− (full name NOD.CB17-Prkdc scid /NCrCrl) and NOD Scid.gamma (full name NOD.Cg-Prkdc scid Il2rg tm1Wjl /SzJ) mice were used to distinguish the requirement for IL-15 signalling in CD8+ T cells and antigen-presenting cells (APCs) to induce disease. We examined the effect of blocking IL-15 signalling on diabetes onset in NOD mice. At 7 months of age, more than 75% of the NOD Il15 −/− female mice remained diabetes free compared with only 30% in the control group. Diabetes incidence was also decreased in 8.3-NOD (full name NOD Cg-Tg[TcraTcrbNY8.3]-1Pesa/DvsJ).Il15 −/− mice expressing a highly pathogenic transgenic TCR on CD8+ T cells. Adoptive transfer of splenocytes from diabetic NOD and 8.3-NOD donors induced disease in NOD Scid recipients but not in NOD Scid.Il15 −/− or NOD Scid.gamma mice. Transient blockade of IL-15 signalling at the onset of insulitis prevented diabetes in NOD mice. Our results show that IL-15 is needed for the initial activation of diabetogenic CD8+ T cells as well as for sustaining the diabetogenic potential of antigen-stimulated cells, acting on both CD8+ T cells and on APCs. Our findings demonstrate a critical role for IL-15 in the pathogenesis of autoimmune diabetes and suggest that IL-15 is a promising therapeutic target. D. Bobbala and X.-L. Chen contributed equally to this work. The online version of this article (doi: 10.1007/s00125-012-2675-1) contains peer-reviewed but unedited supplementary material, which is available to authorised users. An erratum to this article can be found at http://dx.doi.org/10.1007/s00125-012-2739-2. IL-15 is induced by innate immune stimuli and type 1 interferons in various cell types, and is required for the development, differentiation and survival of memory CD8+ T cells, natural killer (NK), NKT and γδ T cells, and certain T cell subsets associated with the mucosal lymphoid tissues . IL-15 also enhances survival of dendritic cells (DCs) and activates DCs and macrophages, and thereby facilitates a robust immune response [2, 3, 4, 5, 6]. IL-15 has been implicated in the pathogenesis of certain autoimmune diseases such as rheumatoid arthritis and coeliac disease [7, 8]. However, the contribution of IL-15 to the pathogenesis of autoimmune type 1 diabetes is unclear. Two studies showed that IL-15 treatment reduced diabetes incidence in the NOD mouse model, suggesting a protective role for IL-15 in type 1 diabetes [9, 10]. One possible mechanism underlying this observation could be the stimulatory effect of IL-15 on NK cells . However, NK and NKT cells contribute to, or prevent, type 1 diabetes depending on the model studied [12, 13, 14, 15, 16]. Regardless of the controversial roles of NK and NKT cells in the pathogenesis of type 1 diabetes, the reported protective effect of IL-15 in type 1 diabetes stands in stark contrast to its pathogenic role in other autoimmune diseases [7, 8]. Indeed, a pathogenic role for IL-15 in type 1 diabetes is supported by the finding of increased survival of islet grafts in NOD mice following blockade of IL-15 signalling in combination with rapamycin . However, this study did not distinguish the contribution of blocking IL-15 signalling from that of inhibiting the rapamycin targets. Besides, our recent findings in an engineered mouse model of type 1 diabetes implicated a pro-diabetogenic role for IL-15 . To clarify the role of IL-15 in the pathogenesis of type 1 diabetes, we used a genetic approach. We generated NOD Il15 −/− mice expressing a polyclonal T cell antigen receptor (TCR) or a transgenic TCR to study the effect of IL-15 deficiency on diabetes onset, islet infiltration by mononuclear cells and the phenotype and functions of CD8+ T cells. We complemented these studies with adoptive cell transfer experiments, using NOD Scid.Il15 −/− and NOD Scid.gamma mice as recipients, and antibody-mediated blockade of IL-15 signalling in NOD mice. Our findings establish a pathogenic role for IL-15 in NOD mice and indicate that IL-15 is a potential immunotherapeutic target in type 1 diabetes. All experiments were carried out under protocols approved by the Université de Sherbrooke Ethics Committee for Animal Care and Use. Mice were housed in micro-isolated sterile cages under specific pathogen-free conditions. NOD (NOD/ShiLtJ), 8.3 TCR transgenic NOD (NOD Cg-Tg[TcraTcrbNY8.3]-1Pesa/DvsJ; 8.3-NOD; for brevity, 8.3-NOD), BDC2.5 TCR transgenic NOD (NOD Cg-Tg[TcraBDC2.5,TcrbBDC2.5]1Doi/DoiJ; for brevity, BDC2.5-NOD], NOD Scid and NOD Scid. gamma (NOD Cg-Prkdc scid Il2rg tm1Wjl /SzJ) mice were purchased from the Jackson Laboratory (Bar Harbor, ME, USA). C57BL/6 Il15 −/− mice  were obtained from Taconic (Germantown, NY, USA) and backcrossed to NOD background for 11 generations and further backcrossed to 8.3-NOD mice for two generations. At the fifth backcross, mice with known NOD Idd alleles were selected for further breeding. Offspring from the tenth backcross were genotyped for 1,449 SNPs using the Illumina platform (Hospital for Sick Children, Toronto, Canada) to ensure homozygosity of the NOD genetic background. NOD Il15 +/− progeny from the 11th backcross onwards were intercrossed to generate NOD Il15 −/− mice and NOD Il15 +/+ littermates. Mononuclear cell suspensions were prepared from pooled lymph nodes, pancreatic lymph nodes or spleen as described previously . Pancreatic islets were isolated following published protocols . In brief, pancreas was digested first in situ by collagenase perfusion, and then ex vivo for an additional 15 min at 37°C. Collagenase digestion was stopped by the addition of cold HBSS containing 1 mmol/l CaCl2. The dissociated islets were collected by filtration through a 70-μm nylon mesh. Flow cytometry antibodies and flow cytometry reagents (detailed in electronic supplementary material [ESM] Methods) were purchased from BD Pharmingen Biosciences, (Palo Alto, CA, USA) or from eBiosciences (San Diego, CA, USA). Expression of cell surface markers was evaluated by flow cytometry using a FACS Canto flow cytometer (Becton Dickinson, Franklin Lakes, NJ, USA) and the FlowJo software (Tree Star, Ashland, OR, USA). Cell proliferation was measured by [3H]thymidine incorporation or by evaluating the fluorescence intensity of 5-(6)carboxyfluorescein diacetate succinimidyl ester (CFSE), as detailed in ESM Methods. For the CTL assay, pooled splenocytes and lymph node cells were stimulated with antigen and CTL activity was measured using RMA-S-Kd cells as target cells, as detailed in ESM Methods. Splenocytes from diabetic NOD mice were injected intravenously (107 cells) into NOD Scid, NOD Scid. Il15 −/− or NOD Scid. gamma recipients. Female NOD mice were injected intraperitoneally with 200 μg of purified TM-β1  monoclonal antibody (mAb) or the control antibody three times a week, between 4 and 7 weeks of age. Diabetes was monitored using urine glucose strips (Ketodiastix, Bayer, Lerverkusen, Germany). Mice with two consecutive readings of >3 (corresponding to 15 mmol/l glucose) were considered diabetic. At the time the mice were killed, pancreases were fixed in buffered formalin and embedded in paraffin. Three non-overlapping (200 μm apart), 5-μm sections were stained with haematoxylin and eosin and blindly scored for insulitis. Cumulative incidence of type 1 diabetes was analysed using the Prism software (GraphPad, San Diego, CA, USA). For diabetes incidence, significance was calculated using logrank (Mantel–Cox) Test. For all other variables, significance was calculated by Student’s t test. Female NOD littermates obtained from intercrossing NOD Il15 +/− mice after the 11th backcross were monitored for diabetes for up to 10 months. As seen in Fig. 1a, NOD Il15 −/− mice showed a very significant reduction in diabetes incidence. At 7 months of age, more than 75% of NOD Il15 −/− female mice remained diabetes free compared with only 30% in NOD Il15 +/+ littermates and 10% in the pure NOD colony. Even though nearly 80% of NOD Il15 −/− mice developed discernible insulitis, its severity was significantly reduced in non-diabetic Il15 −/− mice compared with Il15 +/+ littermates (Fig. 1b). Phenotypic analysis of the peripheral T cell compartment showed a marked reduction in CD8+ T cell frequency and numbers in NOD Il15 −/− mice, and these cells showed reduced expression of the memory cell marker CD44 (Fig. 1c,d,e), as reported in IL-15-deficient C57BL/6 mice . The CD4+ T cell compartment was not affected in NOD Il15 −/− mice and the frequency of CD4+CD25+ T cells was not altered in the pancreatic draining lymph nodes or spleen of IL-15-deficient mice (Fig. 1c, d, e). These results demonstrated a pro-diabetogenic role of IL-15 in the NOD mouse and suggested that the decreased incidence of diabetes in NOD Il15 −/− mice may arise from impaired activation of diabetogenic CD8+ T cells. Transgenic 8.3-NOD mice express the highly pathogenic, MHC class-I-restricted 8.3 TCR, which recognises a peptide derived from islet-specific glucose-6-phosphatase catalytic subunit-related protein (IGRP206–214) [21, 22]. In 8.3-NOD mice, 8.3 TCR transgenic CD8+ T cells (8.3 cells) begin to infiltrate pancreatic islets from 3 weeks of age and become a dominant cell population by 8 weeks . 8.3-NOD female mice develop diabetes between 2 and 3 months of age compared with the 4- to 6-month period required for overt diabetes in non-TCR transgenic NOD mice . To investigate the role of IL-15 on the activation of diabetogenic CD8+ T cells, we generated 8.3-NOD Il15 −/− mice and monitored female littermates for diabetes. At 20 weeks of age, only about 50% of 8.3-NOD Il15 −/− female mice developed diabetes compared with almost all of the IL-15-sufficient littermates (Fig. 2a). Again, insulitis was less severe in non-diabetic 8.3-NOD Il15 −/− mice (Fig. 2b), suggesting that IL-15 may mediate its effects during the early stages of activation of autoreactive CD8+ T cells. However, following in-vitro stimulation with IGRP peptide, CD8+ T cells purified from 8.3-NOD Il15 −/− mice and 8.3-NOD Il15 +/+ mice that were equalised for cell numbers showed comparable levels of proliferation and antigen-specific cytolysis of target cells (Fig. 2c,d). Similarly, antigen-presenting cells (APCs) from both IL-15-sufficient and IL-15-deficient mice induced proliferation of 8.3 TCR transgenic CD8+ T cells with equal efficiency (Fig. 2e). These results indicate that loss of IL-15 does not affect the antigen responsiveness of autoreactive CD8+ T cells but impairs their activation in vivo. To determine whether diabetogenic T cells that are already activated by antigen in vivo still require IL-15 to cause islet destruction, we adoptively transferred total splenocytes from diabetic female NOD mice to NOD Scid and NOD Scid.Il15 −/− recipients, and monitored them for diabetes. Whereas the NOD Scid recipients developed diabetes within 6 weeks after cell transfer, none of the NOD Scid.Il15 −/− recipients developed diabetes, even after 8 weeks (Fig. 3a). A majority of islets in NOD Scid.Il15 −/− recipients showed early infiltration and peri-insulitis (Fig. 3b), indicating that islet antigen-specific T cells had homed to the target organ but were unable to cause disease. Phenotypic analysis of spleen and lymph node cells from the recipient mice 8 weeks after adoptive transfer showed that the donor cells from diabetic NOD mice had reconstituted the secondary lymphoid organs of both NOD Scid and NOD Scid.Il15 −/− recipients (Fig. 4a,b). However, the CD8+ T cell frequency was severely reduced in the lymph nodes and spleen of NOD Scid.Il15 −/− mice, resulting in high CD4/CD8 ratio compared with NOD Scid recipients, and CD8+ T cells recovered from NOD Scid.Il15 −/− recipients showed an activated (CD44hiCD62lo) phenotype (Fig. 4a). To determine whether these CD8+ T cells retained their pathogenic potential, we carried out a serial transfer experiment. We pooled splenocytes from the non-diabetic NOD Scid.Il15 −/− recipients and adoptively transferred to a next batch of NOD Scid recipients. While splenocytes from diabetic NOD Scid mice induced diabetes in the second batch of NOD Scid recipients within 3–4 weeks, splenocytes obtained from the non-diabetic NOD Scid.Il15 −/− recipients did not become diabetic even after 8 weeks (Fig. 4c). These results suggest that IL-15 is continuously required to sustain the pathogenic potential of antigen-stimulated diabetogenic T cells, which could arise from a direct effect of IL-15 on CD8 T cells, modulation of APC functions by IL-15, or both. As IL-15 signalling is essential for the survival of memory CD8+ T cells in the periphery [11, 24], the inability of diabetogenic NOD T cells to cause disease in NOD Scid.Il15 −/− recipients may result from the loss of islet-specific CD8+ T cells from the pool of surviving T cells in NOD Scid.Il15 −/− mice. To facilitate the tracking of islet antigen-specific T cells, we used TCR transgenic T cells specific to MHC-I- or MHC-II-restricted peptides derived from islet antigens, instead of polyclonal T cells from diabetic NOD mice (shown in Fig. 3), in adoptive transfer experiments. As shown in Fig. 5a, splenocytes from diabetogenic mice expressing the MHC-I-restricted 8.3 transgenic TCR were unable to induce diabetes following adoptive transfer to NOD Scid.Il15 −/− recipients, but caused disease in NOD Scid mice. The inability of these cells to induce diabetes in NOD Scid.Il15 −/− recipients did not arise from decreased susceptibility of their islets to immune destruction because these mice developed diabetes following adoptive transfer of splenocytes from MHC class-II restricted TCR transgenic BDC2.5 mice (Fig. 5b). Phenotypic analysis of the mononuclear cells of spleen and lymph nodes of the recipient mice showed that the frequency of 8.3 TCR transgenic donor CD8+ T cells decreased in NOD Scid.Il15 −/− recipients 1 month after cell transfer (Fig. 5c), although their proliferation in response to the IGRP peptide was comparable with that of cells recovered from NOD Scid recipients (Fig. 5d). However, these cells became almost undetectable in NOD Scid.Il15 −/− recipients 2 months after transfer (Fig. 5e). These results suggest that IL-15 is required to maintain the survival of antigen-stimulated diabetogenic CD8+ T cells. As IL-15 is known to modulate the functions of DCs [2, 3, 5, 6], it is possible that the lack of IL-15 in NOD Scid.Il15 −/− mice may also affect the ability of APCs to provide stimulatory signals that may be required to maintain their prolonged survival and renewal. To address this issue, we used NOD Scid.gamma mice as recipients of diabetogenic T cells. The NOD Scid.gamma mice express and trans-present IL-15, but do not express the γc chain (CD132) of the IL-15 receptor complex. Hence, their own APCs cannot respond to endogenously produced IL-15, or other γc cytokines, whereas donor T cells with intact IL-15 receptor complex can. We observed that both polyclonal and 8.3 TCR transgenic T cells from diabetic donors, which induced disease in NOD Scid recipients, failed to induce diabetes in NOD Scid.gamma recipients as in NOD Scid.Il15 −/− recipients (Figs 3a, 5a). However, the NOD Scid.gamma recipients sustained the survival of donor 8.3 TCR transgenic CD8+ T cells better than in NOD Scid.Il15 −/− mice or even NOD Scid recipients (Fig. 5c, top and middle rows), presumably due to increased availability of IL-15 resulting from the lack of its use caused by γc deficiency. Besides, adoptively transferred polyclonal T cells recovered from NOD Scid.gamma recipients showed a normal CD4/CD8 ratio, as in NOD Scid recipients, and the CD8+ T cells showed a CD44hiCD62hi phenotype (Fig. 4b). Even though these cells failed to induce diabetes and showed reduced ability to cause insulitis in NOD Scid.gamma recipients (Fig. 3), they retained their pathogenic potential as they could cause diabetes upon subsequent transfer to NOD Scid mice (Fig. 4b). These findings suggest that IL-15 signalling in APCs is dispensable for the survival of diabetogenic T cells, but is critical for APCs to provide antigenic and/or non-antigenic stimulation necessary to elicit the pathogenic potential of diabetogenic T cells. Given the importance of IL-15 signalling in both CD8 T cells and APCs to sustain the pathogenic potential of diabetogenic T cells, as indicated by the above experiments, we tested whether inhibition of IL-15 signalling would hinder the pathogenic process in type 1 diabetes. For this purpose, we used the TM-β1 mAb directed against the IL-2/15Rβ chain, which inhibits IL-15 receptor signalling without interfering with IL-2 receptor signalling [20, 25, 26]. TM-β1 was previously shown to prevent pathology in a mouse model of coeliac disease . To address the effect of blocking IL-15 signalling in type 1 diabetes, we administered TM-β1 or control mAb, to NOD mice three times a week between 4 and 7 weeks of age. As shown in Fig. 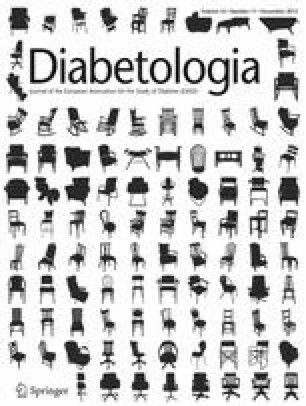 6a, treatment with control mAb did not alter diabetes incidence, whereas TM-β1 mAb significantly delayed diabetes development. Furthermore, TM-β1-treated mice that did not develop diabetes showed markedly reduced insulitis (Fig. 6b). These results indicate that IL-15 is a potential target for immunotherapeutic intervention of type 1 diabetes. The results presented in this study establish a pathogenic role for IL-15 in autoimmune type 1 diabetes. In other autoimmune diseases, such as rheumatoid arthritis and inflammatory bowel disease, IL-15 is implicated in the activation of CD8+ T cells, which in turn perpetuate the autoimmune inflammatory process [7, 8]. Our findings implicate IL-15 not only in promoting the activation, survival and maintenance of diabetogenic CD8+ T cells but also in facilitating the pathogenic role of APCs. The Il15 gene is located on chromosome 8 at 39.33 cM, near the Idd22 locus at 43.06 cM, which harbours certain disease-protective genes . The Idd22 locus lies in close proximity to antioxidant genes linked to protection of islets from damage caused by reactive oxygen species (ROS) in the Alloxan resistant (ALR) strain, and as yet uncharacterised genes in the 129S1/Sv strain [28, 29]. This raises the possibility that decreased incidence of diabetes in NOD Scid.Il15 −/− mice may arise from perturbation of the Idd22 locus via introduction of the Il15 null allele from the C57BL/6 strain. However, this possibility is unlikely for various reasons. First, genetic crosses between C57BL/6 and NOD strains identified the Idd3 and Idd10 loci, while these studies reported no linkage to chromosome 8 that harbours the Idd22 locus . Moreover, resistance to ROS-induced islet damage is unique to the ALR strain, and was not observed in the C57BL/6 strain [28, 31], whose embryonic stem cells were used to generate the Il15 null allele . Second, similar to NOD Scid.Il15 −/− recipients, NOD Scid.gamma recipients do not develop diabetes following transfer of splenocytes from diabetic NOD mice. The gene coding for the γc chain is located on the X chromosome, which does not harbour any known Idd locus . Third, CD4+ T cells expressing the BDC2.5 transgenic TCR induce diabetes in NOD Scid recipients via production of cytokines and soluble mediators, which induce ROS that cause islet destruction [33, 34]. Diabetes induction by BDC2.5T cells in NOD Scid recipients was not affected by IL-15 deficiency, indicating that the Il15 −/− allele does not compromise the sensitivity of the NOD Scid.Il15 −/− islets to oxidative damage (Fig. 5b). Fourth, inhibition of IL-15 signalling in NOD mice harbouring the unperturbed Idd22 locus significantly reduces diabetes incidence and disease severity (Fig. 6). Fifth, we have shown that IL-15 deficiency also affects diabetes induction in a TCR transgenic model of type 1 diabetes in the C57BL/6 background . Sixth, a recent report has shown that NOD mice express a reduced level of Il-15 transcripts when compared with C57BL/6 mice and that increasing IL-15 bioavailability induces diabetes in 30% of BDC2.5 TCR transgenic mice, which do not develop spontaneous diabetes . Again this suggests a pathogenic role for IL-15. Seventh, reports on increased expression of IL-15 in NOD islets upon ageing and upregulation of IL-15 in rat and human islets treated with IFN-γ implicate IL-15 in the pathogenesis of type 1 diabetes [36, 37]. Therefore, the resistance of NOD Scid.Il15 −/− mice to developing diabetes is most likely to result from the lack of IL-15 required for the pathogenesis of type 1 diabetes rather than from the introduction of any potentially protective genes along with the Il15 null allele originating from the C57BL/6 strain. Decreased incidence of diabetes in 8.3-NOD Scid.Il15 −/− mice that express the highly pathogenic MHC class-I-restricted 8.3 TCR indicates that IL-15 is required for the initial activation of diabetogenic CD8+ T cells, independently of its known function of maintaining the memory CD8+ T cell pool [11, 24]. IL-15 has been shown to stimulate the antigen-presenting functions of DCs and to induce production of IL-12 and type 1 IFNs [3, 38], which contribute to the pathogenesis of type 1 diabetes. Neutralisation of endogenous IL-12 in the NOD mouse has shown varying effects on the disease process , whereas blockade of IFN-α receptor signalling between 2 and 4 weeks of age was reported to profoundly diminish the incidence of type 1 diabetes . The latter study also identified plasmacytoid DCs as an important source of IFN-α. Based on these findings, we speculate that the lower incidence and delayed onset of diabetes in NOD Scid.Il15 −/− and 8.3-NOD Scid.Il15 −/− mice could result from impaired antigen presentation and cytokine production by DCs within pancreatic islets and draining lymph nodes, leading to inefficient activation of autoreactive CD8+ T cells. Prevention of type 1 diabetes by blocking IL-15 signalling at a stage when insulitis begins to appear also supports our contention that IL-15 promotes disease initiation. In the NOD mouse, DCs take up islet antigens released during islet remodelling at the time of weaning and present them to T cells in pancreatic lymph nodes . The CD8α+ conventional DC subset (cDC), specialised in cross-presenting antigens to CD8+ T cells during the initiation of autoimmunity, is a major source of IL-15 . As IL-15 signalling is required for survival and activation of DCs in vivo , it is possible that lack of IL-15 may compromise the antigen cross-presentation function of cDCs. Even though TM-β1 mAb depletes NK cells transiently in vivo, this is an unlikely mechanism by which TM-β1 confers protection from type 1 diabetes because NK cell depletion does not affect spontaneous diabetes development in NOD mice [16, 20]. The protective effect of TM-β1 may result not only from inhibiting IL-15-dependent activation of DCs but also from blocking the stimulatory effect of IL-15 on CD8+ T cell activation. We have recently shown that IL-15 enhances the antigen responsiveness of naive CD8+ T cells in synergy with other inflammatory cytokines, such as IL-21, and that this process may play an important role in the activation of potentially autoreactive CD8+ T cells . Accordingly, NOD mice that do not express IL-21 or IL-21Rα do not develop diabetes [42, 43]. We have made similar findings on 8.3-NOD Il21 −/− mice (Chen et al manuscript in preparation). In the NOD mouse model, IL-21 has been shown to act at the level of activation of CD4+ T cells as well as DCs [44, 45]. Together, these observations suggest that IL-15 and IL-21, in addition to their effect on CD8 T cell homeostasis, can also play an important role in the initiation of the inflammatory response that leads to the eventual destruction of the islet. Hence, inhibition of the activity of IL-15 and/or IL-21 in the NOD mouse may prevent the efficient activation of diabetogenic CD8+ T cells both directly and indirectly via dampening the functions of APCs. The inability of splenocytes from diabetic NOD mice to induce diabetes in NOD Scid.Il15 −/− mice (Fig. 3) suggests that IL-15 is continuously required for antigen-stimulated diabetogenic T cells to cause disease. While it is possible that the injected T cells may undergo reduced clonal expansion and/or develop less potent effector functions in the absence of IL-15, it is also likely that these cells do not receive adequate immunogenic stimuli due to compromised antigen presentation. We have presented evidence for both mechanisms. Diabetogenic 8.3 TCR transgenic CD8+ T cells undergo gradual loss in NOD Scid.Il15 −/− mice but not in NOD Scid.gamma mice where IL-15 is available (Fig. 5c). Although the lack of γc chain may affect signalling in DCs by several cytokines, including IL-4, IL-7, IL-15 and IL-21, only IL-15 is required for the survival and activation of DCs, whereas IL-7 and IL-21 are inhibitory  and IL-4 is a dispensable survival factor for DCs [3, 4, 5, 46]. On the other hand, the donor CD8+ T cells, possessing intact IL-15R complex, can use IL-15 available in NOD Scid.gamma mice, which allows them to survive and cause disease upon subsequent transfer to NOD Scid mice, where IL-15 production and IL-15 signalling in APCs are intact. Hence, the inability of diabetogenic T cells to induce diabetes in NOD Scid.gamma mice is most likely to result from the failure of their APCs to use IL-15 and hence to activate CD8+ T cells. Other studies also support the requirement for IL-15 to sustain the pathogenic potential of autoreactive CD8+ T cells. Notably, neutralisation of IL-15 was shown to prevent autoreactive CD8+ T cells from causing skin lesions in a mouse model of graft-versus-host-like disease . We have shown that IL-15 is necessary for CD8+ T cells stimulated suboptimally by cognate antigen or weak peptide agonists to induce disease in a TCR transgenic mouse model of autoimmune diabetes in the C57BL/6 background . Collectively, IL-15 appears to promote the pathogenesis of type 1 diabetes at all stages of the disease, from the initiation of insulitis through to islet destruction. The incidence of type 1 diabetes is increasing worldwide. Newly diagnosed type 1 diabetes patients still harbour a functional islet mass that is not sufficient to meet the body’s insulin requirements. Current immune intervention strategies are therefore aimed at controlling the ongoing autoimmune responses against islet antigens to preserve the residual islet mass and facilitate their regeneration [48, 49, 50]. These strategies will also be useful to improve the survival of islet transplants without resorting to prolonged immunosuppressive regimens. In this context, significant reduction of diabetes incidence and disease severity in NOD mice lacking the Il15 gene, and in NOD mice treated with anti-IL-15Rβ mAb, indicates that IL-15 is a promising therapeutic target in type 1 diabetes. This approach may be combined with other immunotherapeutic strategies in the clinical management of type 1 diabetes patients. We thank Ms O. Borisovitch, Immunology Division, University of Sherbrooke, for genotyping the mice. This work was funded by JDRF Innovative award (no. 5-2010-608) and Canadian Institutes of Health Research operating grant (MOP-86530) to S. Ramanathan. Centre de Recherche Clinique Etienne-Le Bel is a research centre funded by the Fonds de la Recherché en Santé du Québec. SR, SI, YGC, CL, MM, JS, TT, XLC and DB planned the experiments. DB and XLC carried out the experiments. CL, MM and SR generated, monitored and analysed data on the development of diabetes. JS and TT provided reagents and expertise. All the authors contributed to writing and revising the intellectual content of the manuscript. All authors have approved the final version of the manuscript.